23five presents Re:Sound in partnership with the US Forest Service for the 2017 Visions of the Wild Festival. Visions of the Wild is an annual festival of arts and conservation presented by the Forest Service each September. Changing Landscapes explores the ways our environments have changed over time, and where they may go in the future. Artists will explore the changing climate (as it relates to factors like fire or flooding), restoration of local ecosystems, how our environment shapes human relations, and landscapes of the imagination. 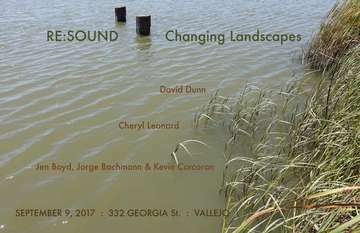 As part of the festival Re:Sound will present a lecture and concert on September 9th from 4pm-6:30 at the River Bank. The venue, River Bank, is a 1920’s Beaux Arts building in downtown Vallejo. The vault and most fixtures from its years as a bank branch are intact. The main space is 3,840 square feet with 30-foot ceilings.